The divergent realities of people evicted from Fattis Mansions last week, and the victims of the Cape York fire, have highlighted Johannesburg’s nationalistic attitudes towards those in need of assistance from government. Residents from both buildings, which stand close to each other in the Johannesburg CBD, were relocated to the fields of Wembley Stadium in Johannesburg South after losing their homes but their circumstances, and futures, will be vastly different. Fattis Mansions residents were forcibly removed from their building last Wednesday following an eviction order that said the building was legally “destroyed” due to its dilapidated state. Many of the evicted residents of Fattis owned the units they lived in or were renting from the actual owners. Cape York, on the other hand, was a “hijacked” building according to reports and its own residents. The owner of the building, Ethiopian national Jemal Guto Fatto, also confirmed this to Times Live. 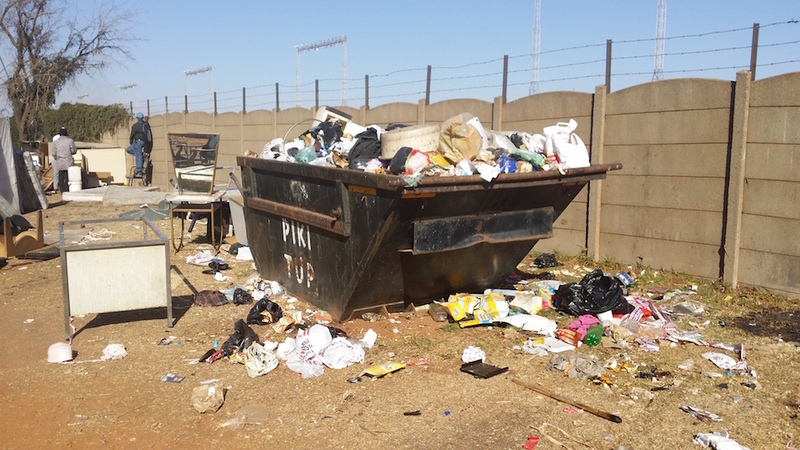 Ex-residents of Cape York said they had been staying at Wembley Stadium for weeks longer than the Fattis community, yet had not received the same support from the City of Johannesburg or civil society. “We just wondering how long we [are] going to be here for. Fattis people have lawyers representing them, no one is representing us and we haven’t heard from the City. They’ve left the trash to rot here,” a former Cape York resident said. Those evicted from Fattis Mansions are being represented by the Socio-Economic Rights Institute of South Africa (Seri), which is pushing for their eviction order to be rescinded. The City of Johannesburg has until Thursday to file a report on alternative accommodation for Fattis Mansions residents. Former Cape York residents said they believed the reason for this disparity is that most of the people staying in Cape York were foreign nationals, almostly exclusively from Tanzania. Fattis’ evicted residents are mostly South African. There’s also some bad blood between residents of the two buildings. Last year the Fattis Mansions residents forcibly removed “foreigners” who were staying in the building. These South African residents said they believed the foreign residents were responsible for violent crimes, gangsterism and drug trafficking in the building. Many of those removed from Fattis moved into the Cape York building and are now living on the fields at Wembley Stadium - next to some of the same people who had pressured them to leave Fattis Mansions. “Those people who are coming from Fattis who have apartheid thinking, they say that they can’t stay with foreigners. But we are all black, we are all African. We don’t deserve homelessness,” another ex-resident of Cape York said. This week Johannesburg mayor Herman Mashaba said the City was in the process of building affordable housing for South Africans, but not for foreigners. “A minimum of 80% of the people in the hijacked buildings are foreign nationals. I will do everything possible to provide accommodation, but the City of Johannesburg will only provide accommodation for South Africans,” said Mashaba. The City has said it would begin a process of deporting foreign nationals residing at Wembley Stadium who are in the country illegally as soon as possible. Loren Landau, a senior researcher at the African Centre of Migration and Society told the Daily Vox that Mashaba’s comments went against the grain of what Johannesburg claims to be - a global, cosmopolitan, African city. “If you really want Johannesburg to be this bustling transit point for people across the continent, we need to ask the question, ‘What kind of housing do people need to live safe and productive lives?’” he said. Landau said that, legally, it may not be the City’s responsibility to provide housing to undocumented foreign nationals. “But [what] Mashaba said included those who are here with documents - asylum seekers, refugees - and I believe constitutionally those people have a right to subsidised or free housing,” said Landau. But Landau believed the situation in Johannesburg spoke to a larger, more philosophical question.